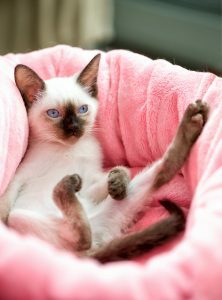 Cats peeing on the bed is more common that you might think but its causes are complex. Patience is needed firstly to establish the cause, and then to try to break the habit. Your cat may be suffering from bladder stones or a bladder infection. These cause severe inflammation and an urge to urinate whenever and wherever they are. Your first stop should be your veterinarian to rule out medical causes. There’s a new baby in the house. Human, dog or another cat, a new baby is a major shift in the home. Cats thrive in an environment that is predictable and controllable. Changes in a cat’s household, even those that seem minor and insignificant to us, can trigger house soiling behaviour. You’ve moved house or your job is taking you away from home for long periods of time. Routine is essential to a cat’s comfort; any break from that can cause stress and anxiety. Your litter box is a problem. First check the location: a busy passage or alongside a noisy appliance like a dishwasher is disturbing your cat’s toilet time. Move the box to a quieter location. You have more than one cat. Then you need more than one litter box. Some cats prefer to have their own litter box and won’t share. Multiple litter boxes is especially good for kittens, as, like children, their control over their elimination is not fully developed. They need multiple, easily accessible litter boxes to help prevent accidents. Your cat isn’t comfortable with her litter box or her litter. If the box has a lid it may restrict her movement or its too high and hurts her arthritic bones getting in and out of it. Some cats object to the litter itself, so experimenting with different types is a good idea when you first take your cat home. Keep that litter box clean. Cats are fastidious about hygiene. Ensure their toilet is cleared of faeces and wet litter every day and is odour free. 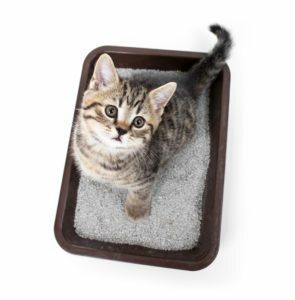 Make the litter box an attractive place to pee: clean litter that’s fine-grained and clumps easily is usually most suitable and change it regularly. Now make your bed unattractive: try covering the bed in plastic (a shower curtain is a good idea) take it non-absorbent and uncomfortable for your cat. Most importantly, be patient. Remember that punishing your cat will only make the cat more fearful and anxious and therefore more likely to continue the habit.